Shirlee Posner is a food writer, photographer and stylist who writes local food blog Eat Surrey, and also teaches Aspects of Food and Food Innovation at Surrey University. This recipe came about thanks to a glut of gooseberries in her garden, but if you aren't lucky enough to have your own gooseberry patch, here are a few places where you can pick your own fruit in Surrey. Shirlee Posner of foodie blog Eat Surrey combines three of summer's best flavours in this delightfully seasonal jam. It's a great way of using up a bumper crop of home-grown gooseberries and rhubarb, or why not pick your own at a farm near you? Shirlee recommends this jam for topping banana scones, layering cakes or simply smothered on toast. Before you begin cooking, heat the oven to 100°C. Pour around 2cm of water into an oven-proof dish and stand your jam jars in the dish. Leave the jars in the oven to sterilise while you make the jam. The lids can be placed in a mixing bowl and covered with boiling water from a kettle. Cut the rhubarb into 1cm chunks and top and tail the gooseberries - this can be done with scissors. Place the fruit and apple juice or water into a medium-sized heavy saucepan. Lay the elderflowers on top and allow to infuse while you bring the mixture to the boil. As soon as it boils, turn off the heat and leave to stand for 10 minutes. Remove and discard the elderflowers and add the sugar to the pan. Bring back to the boil (around 105°C if using a jam thermometer) for 10-15 minutes or until the mixture has thickened and looks syrupy, then stir in the elderflower cordial. Allow the jam to cool for 10 minutes before pouring the jam into the jars. 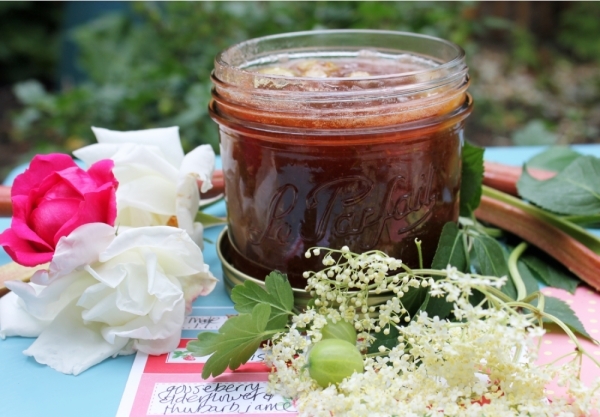 "This jam is heady with the aroma of elderflowers, tart from the gooseberries and with a pink glow from the rhubarb. I saved a handful of gooseberries and rhubarb to chuck in during the last five minutes of cooking to add a little chunkiness but if you prefer a smoother finish put all the fruit in at the same time. In this recipe, I use the classic ratio of the same weight in sugar as the fruit. That means there is no pressure on how much you make and it always works. I use jam sugar that has pectin added but actually gooseberries have their own, although in this recipe, as I was adding other fruit, it helps. If you want a lower sugar jam, use 50g sugar to every 100g fruit. It will be a little runnier and you must keep it in the fridge and use it up in three weeks."